How the Hell Does This Fish Get Around? That’s a legitimate scientific question. 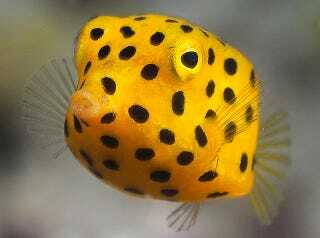 Multiple teams of researchers have wondered how the yellow boxfish manages to swim when it looks like someone attached fins to a cube of cheese. Find out how this thing moves. If you’re wondering how this tiny, bright, cube-shaped fish doesn’t end up becoming the snack of every other fish on the reef, the answer is simple. The fish, when under stress, excretes so much poison that it can kill not only the fish that eats it, but any fish that even come near it. But it also has to feed itself, and that must be a challenge for something so clumsy. For a while, it looked like this fish had the ultimate way to get around. Not only did the cube-ishness reduce on drag, claimed the Mercedes-Benz engineers who designed a car based on the fish, but the box shape created little vortices which allowed the fish to stabilize itself in the water. When the fish got tilted off course a vortex would be created around the edges of its shell (and its shape is due to a shell, not weirdly-cubic flesh), and the vortex would tug it back into place. In other words, this fish uses its unstable swimming to turn more easily. And when it really needs to keep itself to a straight line? That’s what its fins are for.